Sleeps 2 - Hill Cottage is an unusual and quirky cottage set in an elevated position on High Barrass and has a private enclosed patio area for exclusive use by guests. The property underwent an extensive renovation project in 2017 which created this fantastic hideaway for two people. Hill Cottage is bright and sunny and benefits from sea views on all floors with one of the best in Staithes from the dual aspect lounge on the second floor. The heating is a mixture of underfloor and thermostatically controlled heaters and there is a pressurised hot water system. A log burner is located on the ground floor and we provide a complimentary initial supply of logs and kindling October to April inclusive. Free Wi-Fi access. Please note that the internal staircases are steep and may not be suitable for people with mobility issues and there is some restricted head height on the top floor. 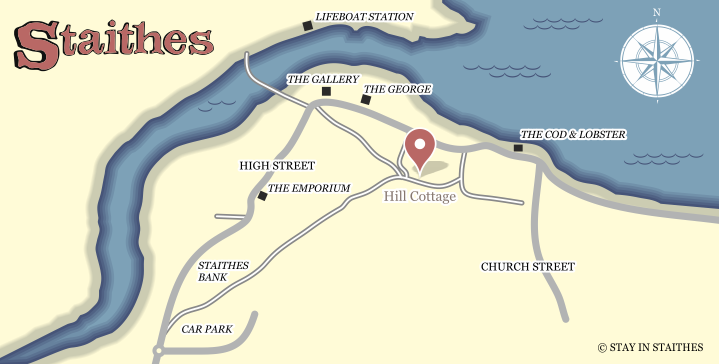 Hill Cottage is only a short walk to the harbour, local pubs and village amenities. Guests will need to approach the cottage on foot and short term parking is available in the High Street for unloading. The main car park is a 5-10 minute walk from the cottage and we provide one parking permit when charges apply March to October inclusive. Ground Floor – open plan kitchen diner with electric oven, halogen hob and fridge with freezer compartment. Dining table and chairs; small sofa; TV and digital radio. There is a window seat to the rear from which to admire the views across the rooftops towards the harbour and sea. Fully tiled floor with underfloor heating and log burner. Staircase leads up to first floor. First Floor – landing area with chest of drawers. Double bedroom with shelved alcoves; king sized bed; underbed and hanging storage. Staircase leads up from landing to the second floor. Second Floor – beautiful open plan lounge area with dual aspect views across the whole village, harbour and the North Sea beyond. There are some unusual ceiling beams made of ships’ masts which have been fully restored and stripped original floorboards. Modern style sofa plus and chair by the window with snuggly sheepskin throw from which to admire the amazing view; TV and DVD. The house shower room is also on this floor with large walk in shower, toilet and sink. Outside – from the side of the cottage a path leads down to the enclosed private garden area which has a mixture of decked and stone flagged areas. There is a bistro table and two chairs set on a raised decked platform.